We had always planned to visit an onsen during our multiple trips to Japan and had never had the pleasure of being in one yet. Having heard that the experience can vary greatly depending on if the ryokan is more modern or not, we decided to stay in an authentic Japanese onsen with a modern touch that would be both comfortable and traditional at the same time! The Hakuunsou ryokan in Hakone is also more personalised for guests, with separate bathing times for the main bathing area outside of the hotel and the option of a small onsen bath in the room itself. Hakone is known for its many beautiful onsen ryokan’s as the waters around the area are supposed to be very beneficial for your heath and the beautiful surroundings add a peaceful feeling to your stay. This really appealed to me as the private contemplation that comes with such a relaxing view and the hot water from the onsen is truly the best part of the onsen experience! It also cannot be fully enjoyed if the baths are crowded. I had imagined a proper onsen ryokan experience to be composed of a couple of important features- multiple natural mineral baths, a comfortable room with traditional tatami mats and décor, good food and a peaceful nature surrounding. While not quite like a spa experience, an onsen is equally relaxing and with food that is usually chosen for its health benefits, entirely benefiting the mind and body. Therefore this choice was very important, and although I had wavered before and not gone previously, on my summer trip I decided this would be the best time for it. This would be the best way to experience another part of Japan and get out of the bustle and heat of Tokyo. Fact File: To first explain the customs of Japanese baths and the incredible experience that comes with the baths themselves, it is important to note that Japanese baths are not quite the same as a sauna or a Turkish Hammam, although the community bathing principle of the Hammam is similar. A Japanese onsen is a bathing area, usually separated into two baths separate for the ladies and for gentlemen, rotated every twelve hours to give both genders time to appreciate the unique properties of each bath. Most onsen come from underground hot springs and all possess different properties, with varying minerals depending on the area that the onsen is placed in. In recent years, some onsen resorts choose to simply offer hot baths without these natural mineral properties, however an authentic Japanese onsen would never be without their own ‘special’ regional healing water. An onsen ryokan translated roughly as a ‘bathing inn’ and can vary from the most luxurious experiences to a simple Japanese interior and a bath without meals provided. A visit to a ryokan is customary in the week following Christmas before people start work again, as a way to energise for the new year and spend time with loved ones in a comfortable and soothing atmosphere. Hakuunsou onsen ryokan is located in Yugawara, around 10 minutes drive from the station. From the Shinagawa station in Tokyo you can take the Tokaido-Sanyo Shinkansen which will get you to Yugawara in around an hour and a half. We had chosen not to use the shinkansen as it was the most expensive option (at around 35 pounds without the Japan Rail Pass), however it is also the quickest, with other trains being cheaper, but taking almost double the time. Once you arrive at the station, taking a taxi from the station should not be that expensive, especially since the Yugawara station is less popular than the Atami one where most of the most famous onsen are located. The onsen is located some way up the mountain in Yugawara and is secluded and separate from the main town. This makes it the ideal location for a relaxing stay! We were on our way to the onsen! Once we arrived at the onsen, we were greeted by one of the staff who offered to take our bags in while we admired the exterior of the onsen. Although the rooms and eating area are located in one main building, the main baths were located just next to it in a small separate building close to the river. This idyllic setting was exactly what we had waited for after days of active sightseeing and mountain climbing. We were ushered into the reception area, where we were taken to a long table on the far right where we were asked to sit down. Once we had sat down, a lady came over with some tea and a Japanese wafer biscuit to contrast with the light, fresh bitterness of the tea. Looking out through the window onto the rolling water below was already so relaxing, and this was only the beginning of our stay! In our ryokan, the lady gave us a choice of yukata robes to wear around the onsen instead of our normal clothes. Changing into these is encouraged as they add a relaxed sense to the experience, letting the guests revel in their baths and food instead of putting effort into appearance. The yukata are easy to put on and do not require adjustment and padding like a kimono. We were then escorted to our rooms after filling in some formalities on food preferences and private bath time preferences. 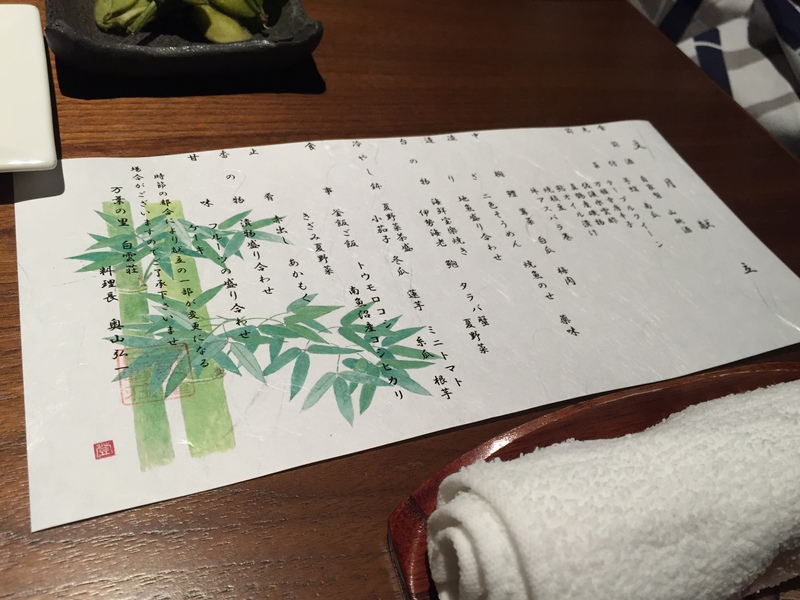 We had chosen to book out the main onsen for a short time period (it is sometimes allowed in some of the more private onsen ryokan) that evening. Our room was located on the second floor and was quite large, with our sleeping are with two futons, a relaxed TV area, the bathroom and toilet separate and our private bath outside our room overlooking the river and the greenery. Traditional Japanese rooms are sparsely furnished, with many only having a futon to sleep on and a lamp, choosing to keeping everything else closed off in hidden wardrobes within the walls. Ours had an extra futon in it and some thicker winter sheets that were no doubt stored there for the time being. Muted shades of brown and beige ran through the room, with beautiful tatami mats on the floor and a hanging illustrated scroll on the wall behind our beds. The sparse furnishing leaves little in excess- you are presented with everything you need right there, with no need for frivolous decoration. I love the way that the room felt so warm and cosy, yet simple and elegant because of the lack of decoration and the warm tones. Our futon beds on the tatami floor-to focus on sleep and nothing else! Interestingly enough, many Japanese salary men choose to stay in onsen ryokan when they have any time off as the relaxed surroundings and peaceful atmosphere take them away from pressures of work and home life. Japanese women choose to experience the onsen with and without their partners- many onsen ryokan offer special deals and getaways for female groups, focusing on light food, refreshment and baths. However, it is probably more common to see couples and small groups of women rather than families in these private ryokan. I mention this in regards to the hen and chick scroll painting above- family conception is not so far away for many of the staying Japanese couples, in hopes that the romantic weekend getaway will lead to a future family! Our room was separated by glass with the bathing area, where there was a shower and the onsen bath, large enough for two or more. Unlike a jacuzzi with bubbles, Japanese baths are focused on long soaks in very hot water, followed by light refreshments. After refreshing ourselves in our room (Japanese summer days are typically quite muggy), we changed into our yukata and spent some time in the room watching TV and enjoying the sweet jam and crackers that had been left for us. The area is well known for its satsuma-like fruits, and the jam was wonderfully sweet and citrusy. Staying in an onsen ryokan is mainly composed of baths, foods and exploring the countryside, but we opted out going outside the ryokan so that we could really get the most out of our short stay. We had managed to get the hour booked for us in the main bathing area which was secluded and empty for us when we arrived. Although I couldn’t take any photos inside, there are some on Tripadvisor of the main baths. In the bath area, there are showers and stools with toiletries (this is very typical of onsen ryokan bath areas), and an area to dry off and get some water. Now, à propos the baths- they are VERY hot! Unless you have been accustomed to Japanese baths, staying in one for very long may be a problem. We had booked out forty five minutes of private use, and during that time I went in and came out at least 5 times, usually to get water. What I will say is that my muscles and pores left cleansed and rested after the soak, and we got back to our room absolutely ravenous. During our stay we were told that dinner would be served at two different times and we opted to have it earlier, letting us come back and relax for about half an hour before going downstairs for the first main meal of our stay. 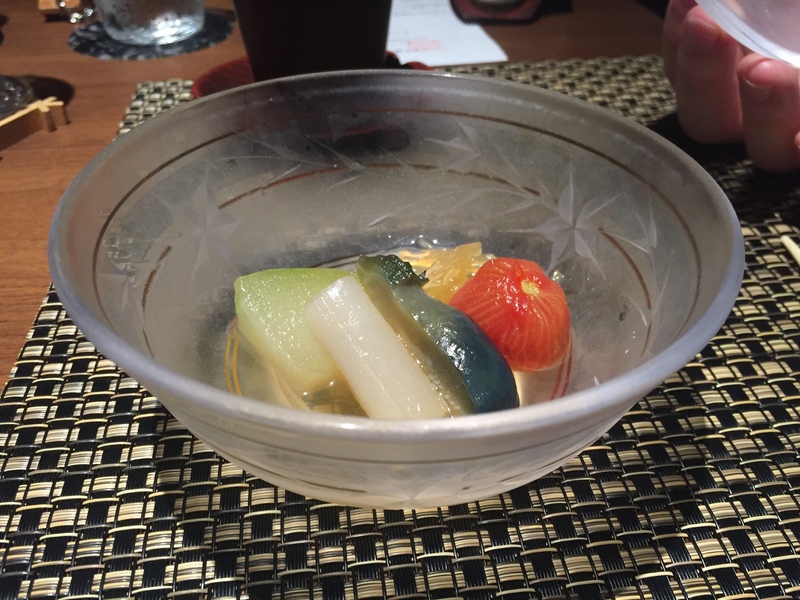 The Hakuunsou ryokan is well known for its fresh, beautiful food that is light and easy on the stomach, making it perfect for the summer heat. After being escorted to our table, we received the menu and a hand-towel, then being informed that our starter will be coming out promptly. The theme being -‘summer’, our dishes were focused around freshness and seasonality. The edamame with stalks and delicate briny whole fish with pickles were very refreshing and light, calling to mind the field and the sea that they came from. The sea snails were not a keen favourite of mine as I have not been able to get used to their rather livery taste, but the wagyu-wrapped asparagus was phenomenal. The tofu was more of a soup/sauce than the standard cubes you get in sukiyaki and the surprising texture and mouthfeel were a delightful change, being both creamy and light, with the tomato adding some acidity to its creaminess. 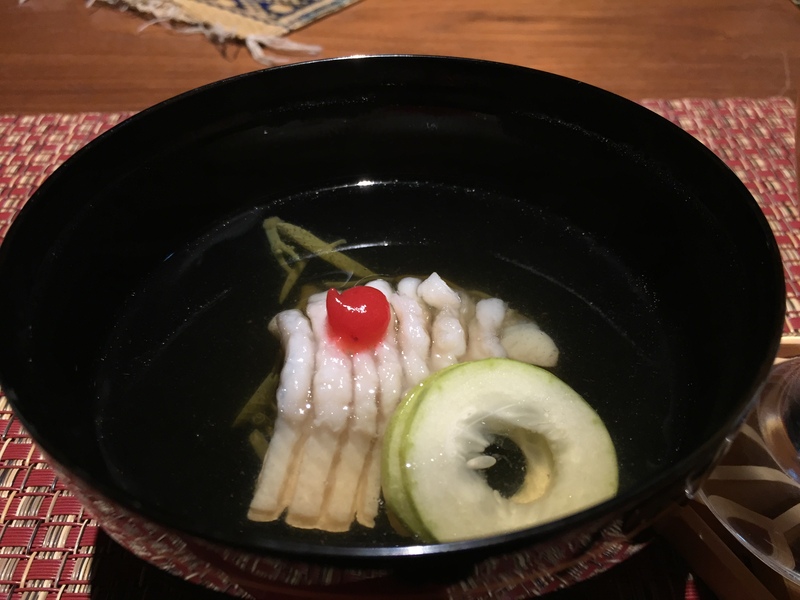 The seaweed is a special variety which is both slimy and crunchy at the same time, compared to a citrusy somen noodle with jelly. The peppers were light and slightly bitter, adding a great crisp finish to the long plate of appetisers. 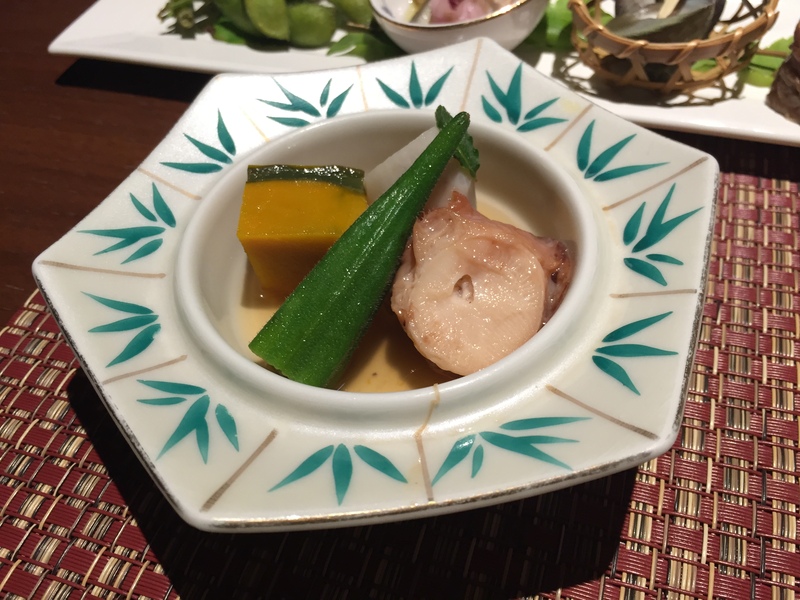 The dish in the bottom left of the group photo was a lightly steamed and sauced version of octopus, okra, yam and kabocha (Japanese pumpkin). This light dish was also served cold which only made the meatiness and sweetness of the octopus more pronounced. The next dish composed of a very light broth with some sort of algae/seaweed with a fillet of fish that had been cut widthways to splay out when placed in the soup and Japanese cucumber and ume paste. This was very light and had a faint flavour, but complemented the meal very well. This was one of my favourite appetisers here, with the cold somen noodles in the summer dish (it was light blue with a red streak reminding me of the Japanese kites) being accentuated so well with the ginger and the red snapper. Definitely a crowd pleaser! This incredible selection is common to high priced Japanese sushi and izakaya selections, with the freshest fish being displayed as sashimi. 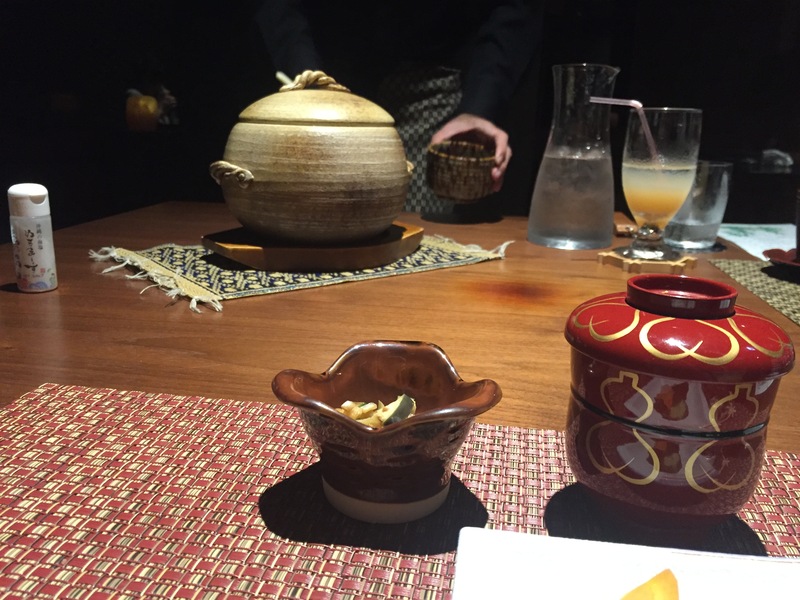 These were served here with locally-brewed soy sauce, crab miso and freshly grated wasabi. 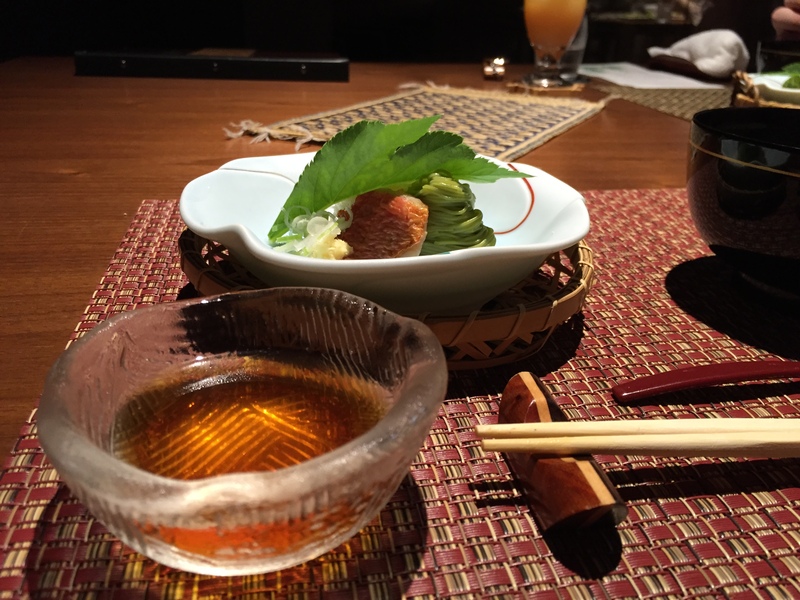 The fish and uni were all at peak freshness with beautiful tight skin that melted away to juicy meatiness with the tuna, and a light crisp bite with the snapper. 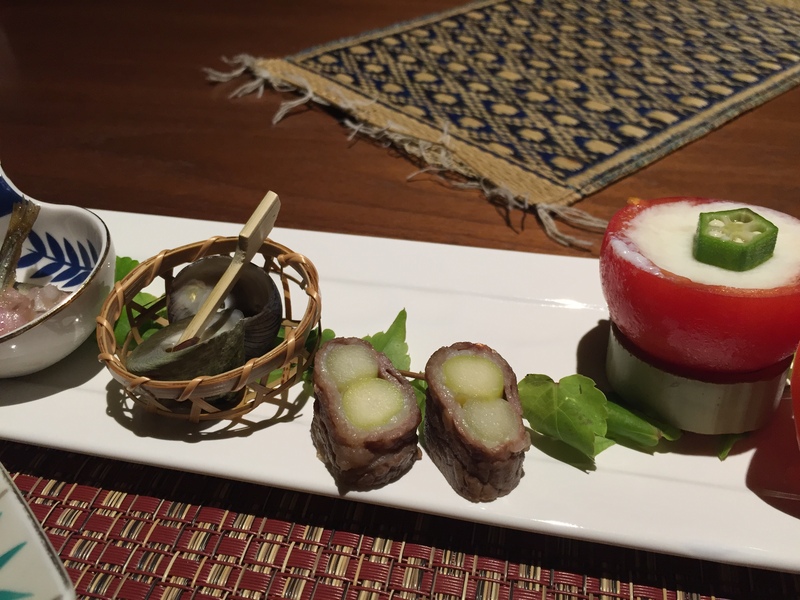 I loved the fact that they allowed us to have a piece of wasabi just for this dish- wasabi is expensive and tasted best when it is at peak freshness, just after it is grated. 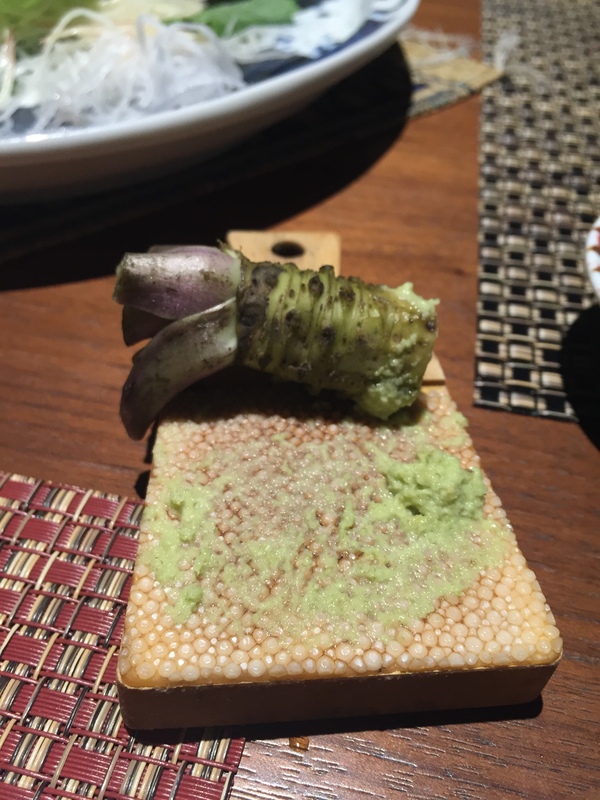 With such a large portion of the root, we had enough wasabi for every piece. 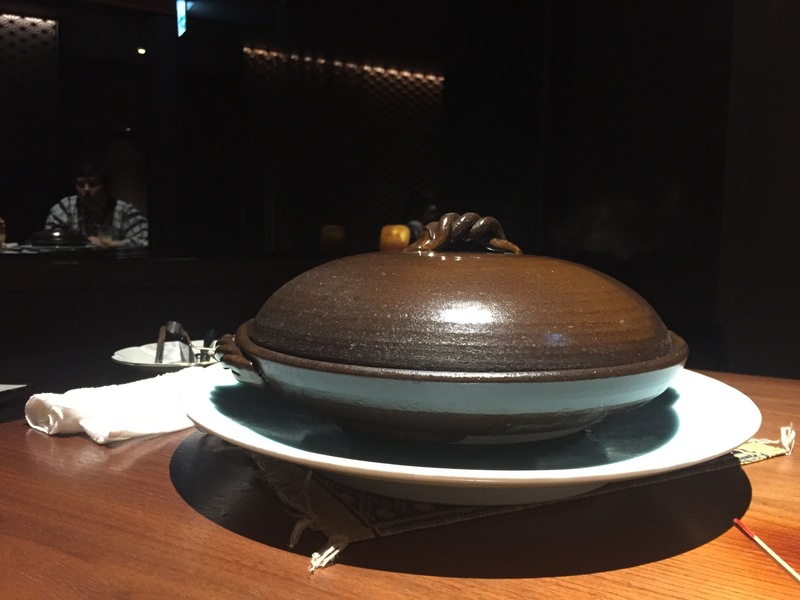 The mysterious black clay pot that stood before us on the table contained the main meal, and was getting steamed and cooked with a hot stone right before our eyes. 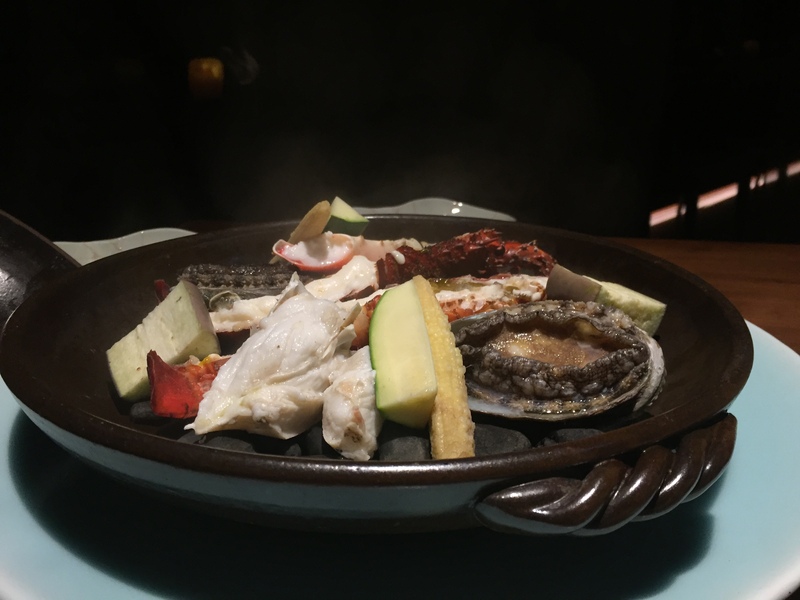 The server lifted up the lid and placed a large, hot stone right in the centre of the dish, letting the incredible ingredients inside cook lightly with steam. The inside of the incredible pot contained lobster and abalone, with fresh seasonal vegetables alongside. Just like in Hokkaido, I loved breaking through those tough shells to get into the wonderfully succulent flesh inside. We had been provided with salt and sauces to dip the lobster in, but it really was best the way it was. The abalone is a notoriously difficult shellfish to cook as it can become very tough and rubbery if it is not cooked well. The best part about the hot stone steaming was that it created a very soft, lightly cooked abalone that retained all of its flavour without becoming tough. The incredible detail on the pot also has to be commended- it is interesting to see that this is a main cooking method for larger dishes like this and the rice that we had later. I was so used to thinking that the electric rice cooker is the best for cooking these dishes, but these actually cooked them much better! 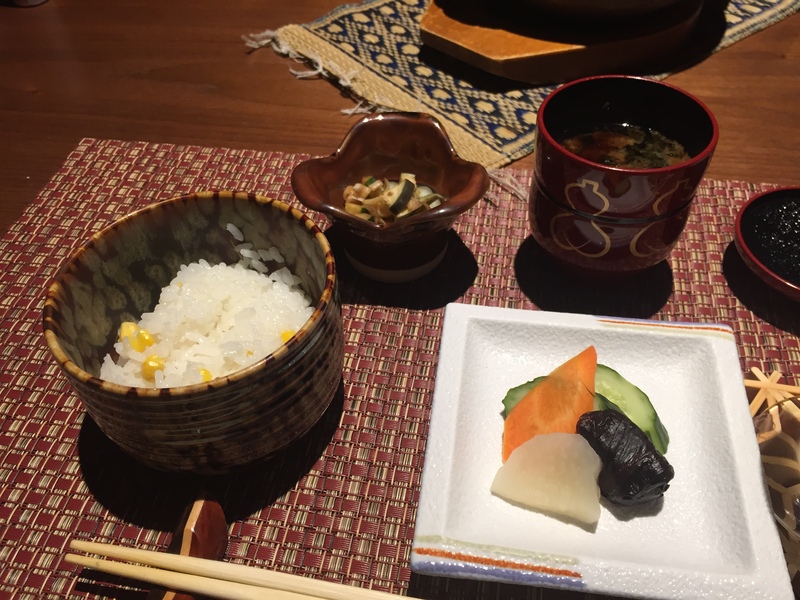 The rice from this ryokan was truly incredible, and the local varieties are definitely more tasty than the one I use at home, but this really was special because it is the first time I had tasted regional rice. Although rice is considered to be such a staple in Japan, I never realised that different areas might produce their own in small batches, much like local varieties of pasta in Italy. It was quite sticky, but the grains very separate from each other and were complemented very well by the sweet corn mixed in. The amount of vegetables in our meal truly showed me that not everything has to be covered in meat for it to taste incredible. 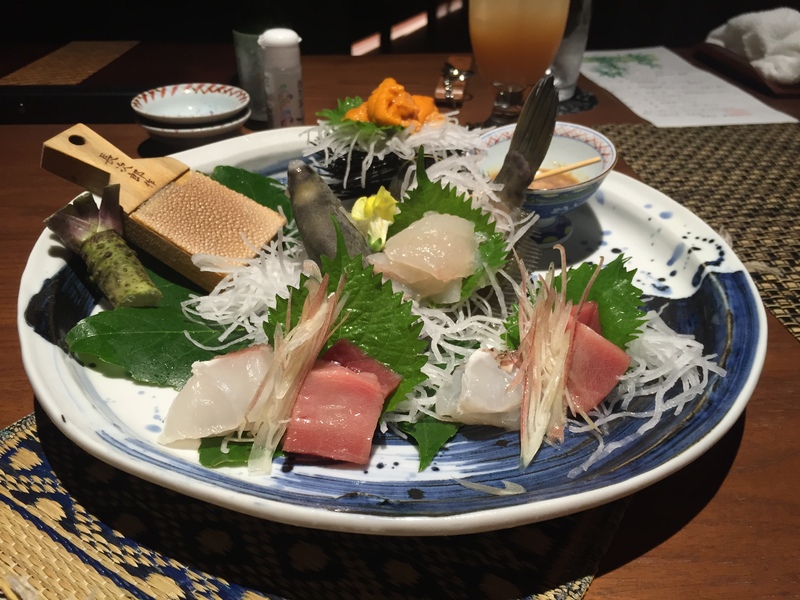 In Japan, meat and fish are not treated as superior to vegetables, with a healthy mix of both being preferred. This meal had been very light and easy to eat, with flavours that had to be savoured to be truly appreciated. 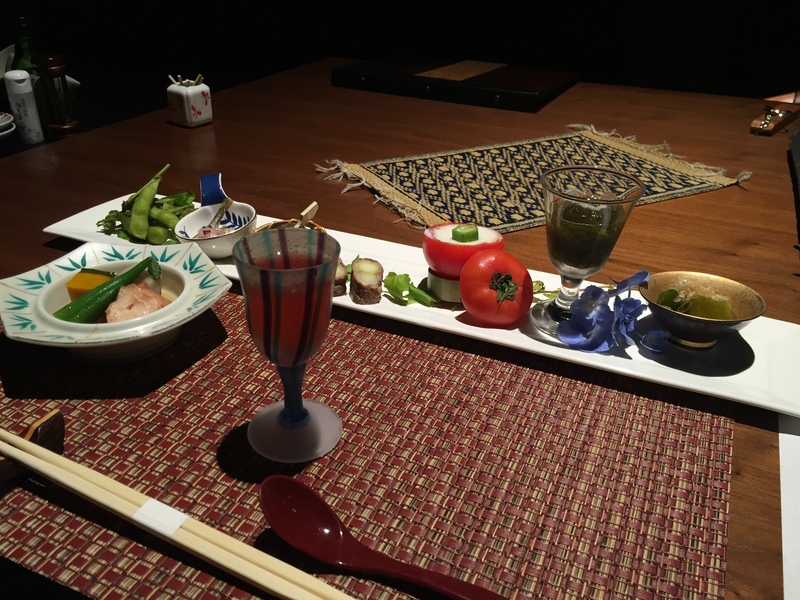 Although they may not have been very obvious, I am grateful that in this ryokan, I had more time to truly taste every ingredient in turn. This last dish left us feeling quite full, so we were happy (and sad) that our delicious main meal was nearly coming to an end. After the last course was cleared away (we had polished off all the rice in the big clay bowl), we were taken through to the long table by the window where we were seated for dessert. Looking out onto the beautiful plants outside and the roaring river, I have never felt more peaceful! We were given English Earl Grey tea and a selection of small cakes, perfect for one mouthful. After such an extensive dinner, dessert almost didn’t seem necessary but it was nice to savour something sweet with our fellow diners before heading back up to our room. After about an hour we visited the baths located in the basement of the ryokan. The two baths, separate for men and women both had a changing room with baskets and all the necessary amenities. In Japan it always surprises me that they do give more than just the standard soap set seen in English hotels- here we were given lotion, skin creams and cleansers. Before heading into the bath, it is necessary to wash off using the showers placed next to the baths. The baths were wonderful, with two small baths, big enough for at least four people to comfortably bathe in at the same time. Right next to the river, it was very relaxing and I found myself falling asleep in the hot water. Short of dehydration, I decided it would be best to head back up to the room to fall into those wonderful futons after the meal and the baths. Look out for my second day at the Hakuunsou ryokan, coming soon!